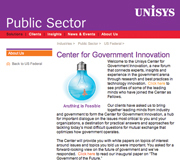 BLUE BELL, PA: Unisys has launched a think tank, Unisys Center for Government Innovation, as part of a larger plan to position the company as a thought leader in government IT. The global IT company announced the launch on March 16 with a news release, outreach to government trade publications, and the creation of a Facebook group, said Patricia Davis-Muffett, VP of global government marketing for Unisys. O'Keeffe & Company, AOR for Unisys' government business, is providing media support for the effort, said Brad Bass, director of PR for Unisys. The board for the center includes former government officials, such as Tony Valletta, former deputy assistant secretary of defense for command, control, communications, and intelligence. The board will also include Unisys industry experts who will participate in research programs, white papers, webinars, and roundtables, some of which will be private, while others will be open to the public. Davis-Muffett said that many of the board members had previously been advisers to Unisys, but the center enabled the company to make better use of the relationships. The center plans to provide weekly updates about the center and its board members on Facebook – one of the company's first major forays into social media. That effort is targeting people who work for the government and companies that service the government. Unisys' previous social media efforts have not been integrated into the marketing strategy, but have been more employee-driven, noted Davis-Muffett. While much of the generated information is targeted at professionals in the government marketplace, the press release, paper, and survey were posted to Facebook with a goal of generating online discussion among the community there, she added. Plans also include a presence on Twitter and LinkedIn.